Play Manga Lily and more Girls Games on Games1.com! Konnichiwa, Lily games meets Japan! 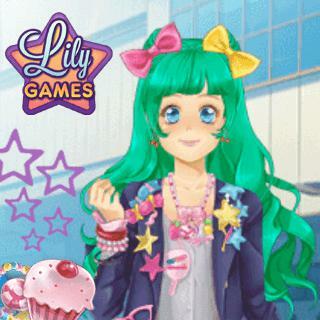 In this funky title, Lily is visiting Tokyo's famous Harajuku district where kawaii fashion trends are born. Create unique street style outfits and try some outrageous looks, the possibilities are endless! Choose from cool Manga hair styles, trendy dresses, tops, bottoms, shoes, and cute accessories, and make Lily a true fashion icon!